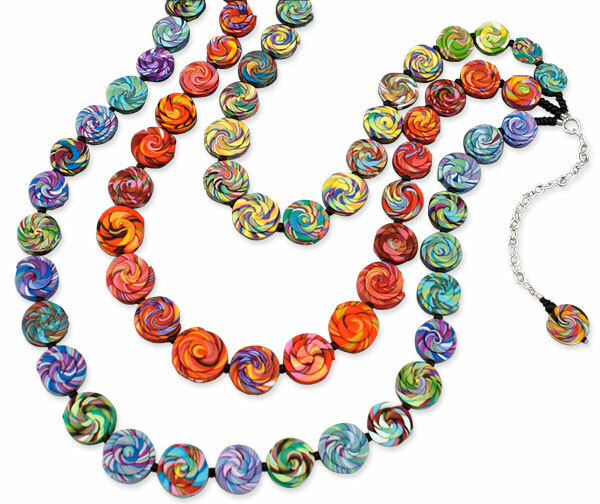 Some happy polymer colors from Kimberly Arden to start your week. In the summer Kim and her husband work with boisterous energy and sell with enthusiasm at shows all over the midwest as they work their way down to their winter home in Florida. Let the energy of these simple spirals spill over you. More colors on Pinterest here. Judy Belcher will scoop up the last bits of your data tonight. We want to paint an accurate picture of our community in a presentation at Synergy. Please stand up and be counted here. Read about Kim in this edition of Costco Connection! Thank you so much for the feature on PCD! It has been the very most amazing week!!!! We came home from an anniversary cruise late Sunday night. On Monday morning, my facebook page was a buzz with the news about being featured on your site. I have received several hundred emails saying that people are now following me on Pinterest! I’d better get busy and pin a ton of work! Then I saw that the article in the ‘Costco Connection’ was online and being delivered this week. But instead of sipping wine and having grapes fed to me, I had to work my tail off for this past weekend’s show. We did well and I have another crazy full week ahead of me. Meanwhile, my website mailbox is packed with a least a hundred messages from people that saw my work in the magazine. Wow, I am so very fortunate and completely overwhelmed! Thank you again, Cynthia for everything!